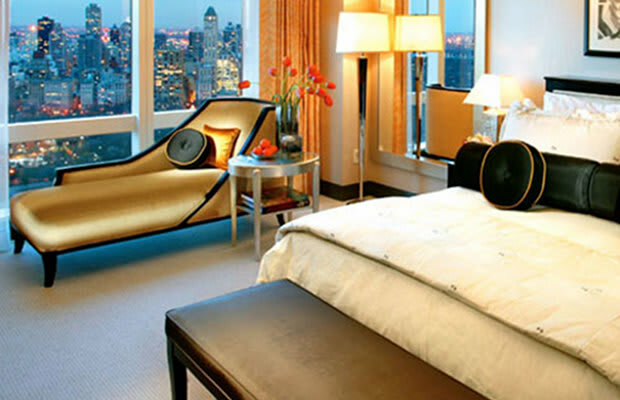 While it might be the hype that draws big spenders (Standard Rooms are around $750) out to these 5-Star digs in droves, it’s the Columbus Circle property’s superluxe features—like Central Park views, deep soaking tubs looking out onto the city and Hudson, and a holistic spa with ample treatments for your inner metrosexual—that keeps them pushing their checkout dates further and further back. Cool off from the summer heat with some laps in the Mandarin’s immaculate pool, then throw on your Saturday best for a manly drink at the ‘30s-inspired MOBar, or some awesome eats at the award-winning Asiate, which specializes in German cuisine (we jest. It’s Asian. What’d you think?) Plush beds with Italian linens ensure you rest in pimped out peace.